You may have heard me mention previously that I'm really not a fan of hair removal. Not just because it's a complete pain in the arse to do and keep up with but because most methods of hair removal leave me with a rash and itching that's enough to drive you crazy. I use an electric shaver because this is the least skin irritating method of hair removal for me, but disaster struck recently when my current shaver broke. Actually it didn't even break, it just stopped working, as in it stopped cutting hair. I ran it over the same area several times and the hair just stayed in place, pretty pointless really! I didn't particularly want to buy a new shaver at the time so I thought I'd return to wet shaving for a while. I managed to minimise the rashes as much as possible using aloe vera gel but it didn't prevent them completely. I love how close wet shaving is, my legs haven't felt that smooth for a long time, but I got fed up of constantly scratching my legs and decided that regularly suffering from a rash can't be good for my skin. After reading a couple of reviews recently about epilators I decided this was something I'd quite like to try. My thinking was that most of them appear to also come with a shaver head, so if I couldn't stand the epilating I could switch to just using the shaver head instead. I headed to the Boots website to take a look at prices and was disappointed to find that they're actually pretty expensive. One day I spotted the Braun Silk.épil 3 was half price for £30 and as I also had a £5 off electrical beauty voucher for Boots I decided to take the plunge and try it. Lets talk about epilating first as that's probably what you want to know about if you've come here from Google. It's a scary looking thing isn't it! It has 20 tweezers and two bars, one either side of the tweezer part, with rotating spiky pink plastic bits to 'massage' the skin. Although these are intended to massage the skin to try and reduce any pain experienced I actually find these kind of uncomfortable, but in a way that does help distract you from the pain of the hair being removed. When I first turned this on I have to be honest and say I found it pretty terrifying. It whizzes round so quickly and makes quite a bit of noise and I didn't want to put it on my skin in case it ripped half of my leg off. It took me quite a while to pluck up the courage to give it and try, but when I (eventually) did it actually wasn't too bad. I think I have a reasonable pain threshold on my legs and to be honest I didn't find it too painful, it felt like a combination of a pin prick/pinching sensation. One thing I do need to mention is I have tried at home laser hair removal before and towards my feet I do have bald patches on my legs where the laser treatment worked well. So in some areas I have a much lower concentration of hairs than most people might have. On the areas where there's a higher concentration of hairs the pin prick/pinching sensation is obviously more intense as there's more hair there. In some places I did find myself pulling an 'ooh' face, but it was still bearable, especially when thinking about smooth legs for weeks. The problem I have with this is I find that it doesn't pull out all hairs, or even the majority of the hairs, in one swipe. On balder areas two swipes were probably enough, but in denser areas I got up to three swipes and there was still the odd hair left here and there. I have no prior experience of epilators, but I'm thinking this probably isn't great? I should probably mention that the most I have epilated is the front part of one leg because I'm so frustrated with how many times I have to keep going over the same area. Although I haven't suffered any rashes after epilating, just some redness/very slight swelling, I'm concerned about irritating my skin by repeatedly epilating the same area. I have only used this on the slower setting so far for 'extra gentle' epilation. There is a higher setting for 'extra efficient', which might help with more hairs being removed at once, but also then might be more painful. I'm not sure I can pluck up the courage to try this speed though! If you're interested in how well the shaving head works I'd say it's just okay. If you've ever used an electric shaver you'll know it's not the closest shave and I do have to go over some areas a few times (in some areas my hairs grow in funny directions!). It's not the best electric shaver I've used, but it does remove hair, so it does the job. The final thing to comment on with this is that it's mains power rather than battery and also comes with a European plug, so you will need an adaptor. I don't mind either as I already have an adaptor for various electric things and with batteries you obviously have to replace them and as they drain this means the shaver starts to get slower and slower. The cord is a reasonable length so you don't have to virtually sit on top of a plug socket. As with most electrical items I think the more you pay the better product you get. Full price this is £60 and if I'd paid that much I'd definitely be disappointed. To be honest I'm actually quite disappointed for £25. So I think to get a decent epilator you may need to pay something around £80-£100 plus. I'd love to try a more expensive one, as I'd really love to give epilating a good go and I don't think I can with this one, but unfortunately that's out of my price range at the moment. If I do pluck up the courage to try the 'extra efficient' speed I'll do an update post to let you know! Have you tried epilating or is this something you would consider trying? Thank you for this honest review, I hate hair removal and I've been debating how to up my game but I'll probably give this a miss now. Waxing is painful, and it should not be done on the face. 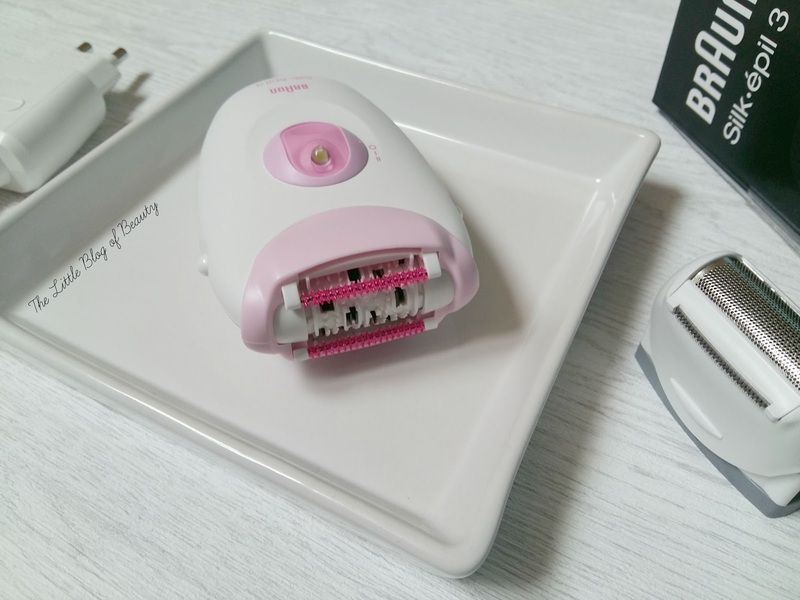 Since, I always wanted to get rid of the unwanted hairs on my face, so I started using Braun silk epil, so it has become easier for me to become party-ready within minutes.